LAMPHAI INTATHEPA role playing game (RPG) mixed with puzzle element, BadGreen, to instill responsibility towards environment and a sense of waste sorting was among the outstanding software creations of Thai youngsters.Worachet Usadee, a Mathayom 6 student at Rayong Wittayakom School and one of seven game developers, said that awareness on environmental conservation depended on individual’s consciousness. Nevertheless, they hoped that BadGreen would help build that awareness.The game begins with the nature’s anger that human was throwing garbage anywhere. So, it decided to conquer an earth which is then all covered by undesirable weed.A player has to take on a role of the hero to fight with garbage monsters, and is asked to correctly sort the different kinds of garbage into recycle, dangerous and waste bins to gain a combat skill.The game settings take place in four regions of Thailand and the last scene is in Bangkok where the player has to slay the big boss monster to bring back the GoodGreen to the earth.“It would help increase environmental awareness, especially on waste sorting among the players somehow,” said the 18-year-old student. Their target players aged above 15.Worachet said that he and his friends have learned computer software development at school and a group of alumni who majored in computer science in universities often came back to help teach junior students.“We are also learning from YouTube. There, a lot of techniques to design and develop the applications are available for free that you can learn anytime,” he said.They got a contact from a state enterprise and private company to support them to further develop the game which is planned to be used for the companies’ corporate social responsibility projects.Another team, the 2015 establishment on the Asean Community has driven a group of three girls at St. Francis Xavier Convent School to develop the "Jack find the treasure" application to learn English language in a funny way.Pitchaporn Likitpanjamanon, a Mathayom 5 student, echoed that English will be more important and useful when the AC is formed, but many students felt bored in remembering a series of vocabulary.“To speak English, it is necessary to know vocabularies. This game would be able to help students remembering English words better,” she believed.The application was designed for Prathom 4-6 students, comprising of lessons with over 300 vocabularies and game.In a part of game, the player assumed the role of Jack who read a provided clue leading to the right location. 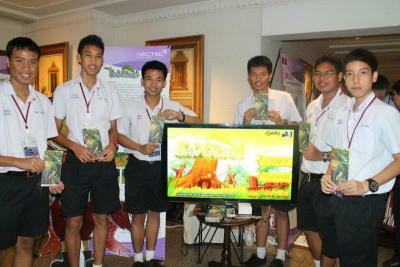 There, the players have to match pictures with correct English words.Both game applications were among the 13 software projects which passed the final round of the 2014 Incubate the Young IT Generation or the Tor Kla Hai Terb Yai, organised by Thailand National Electronics and Computer Technology Center (NECTEC) and the Siam commercial foundation.Developed by Thai youths, a total of 67 projects were submitted but only 13 of them were selected and exhibited at the NECTEC Annual Conference & Exhibitions 2014 at Sukosol Hotel.Kwan Sitathani, deputy director of NECTEC, said the project was aimed to stimulate Thai youngsters’ interest and capability in developing computer software programmes.“The contest is considered as a mechanism to help further develop students’ IT creations to properly serve users in the real world,” he said.During the contest, software development, techniques, market know-how and other related recommendations were provided.The Science and Technology Minister Pichet Durongkaveroj gave an opening remark by emphasizing Prime Minister Gen Prayuth Chan-ocha's policies to increase the value of investment in technology research and development.“But do not only conduct the researches and leave them untouched on a bookshelf. We have to commercialise and put researches into practice in different sectors,” he said.The ministry planed to increase to the country's research and development investment value which now stood at 0.37% of GDP to 1% with an aid of tax incentives to encourage firms as well as the governmental sector to come up with more innovations.Furthermore, the ministry planned to accommodate researchers from the governmental sector and university to spend their time to help the private sector to conduct researches and improve new innovations. Importantly, the Science, Technology, Engineering, and Mathematics (STEM) Education will be improved for not only schools but also a workforce. (END)________________________________This e-mail message and any attachments from Post Publishing may contain confidential, proprietary and/or legally privileged information. If you are not the intended recipient, you are hereby warned that unauthorized use, publication, disclosure, disseminate or copying either in whole or in part of said information is strictly prohibited. If you have received this email transmission in error, please delete it and notify the sender immediately.Post Publishing accepts no liability for any damage caused by any virus transmitted by this e-mail or the consequences of any action taken on the basis of the information transmitted.